(Theory) Why is Xigbar but not Braig a Seeker of Darkness? DDD has shown us that Xigbar will be one of the members of the new Organization XIII but if that's the case, why is it not Braig? What I think is that the Xigbar we see in DDD is the actual nobody version of himself before he died (as Young Xehanort brought him back) but if that's the case, where is Braig? Regarding the cutscene we see in Re:coded HD I think Braig is actually still around living at the same time as his Nobody. It has been confirmed that this is possible since Sora and Roxas existed at the same time. If this is the case, then what is he doing? "Forming his own plans" like he said. Maybe he is using his "Nobody self" as a sort of Body Double while he goes off doing his own thing. The same can be said for other members. To me I seriously doubt that Marluxia will be a Seeker of Darkness due to his betrayals BUT the same cannot be said for Lauriam. Again this can align with the other original members. What do you think about this though? They are the same person. Xigbar is Braig’s Organization 13 name. 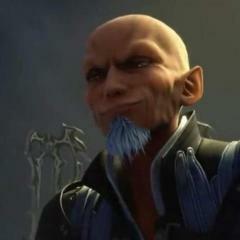 Braig became a Xehanort and part of the real Organization 13 and so his name is Xigbar. Here's an example of what I'm trying to say. Xigbar and Braig are physically the same person BUT mentally the are not. Xigbar is his nobody, Braig is his Somebody. Yes they are both the same person but at the same time they are NOT the same person. An example is Darth Vader and Anakin Skywalker. Physically they are the same by mentally they are both different. Axel is the Nobody. Lea is the Somebody. Sora is the somebody. Roxas is the Nobody. Marluixia is the Nobody. Lauriam is the somebody. Or like the video states, This is Johnny and this is his leg. They are both essentially the same thing but at the same time they are not. Is the situation now clear? And from the fact that Roxas and Sora both existed at the same time at one point it makes me think if the same can happen for the other nobodies. I think Xigbar is Braig but the reason Braig is called Xigbar is because he has renounced his original persona's name and has accepted his Xehanort name instead, know what i mean? Xigbar and Braig are the same person but they are different individuals (and different "race" as well). Braig is a human while Xigbar is Braig's Nobody, and Braig lived on as Xigbar as a Nobody after he lost his heart to darkness (so same person but different individuals). In the Destiny cutscene from Re:coded, all of the individuals there are humans after their Nobodies are destroyed except for Young Xehanort. After that, Braig and Isa disappeared to somewhere, presumably to where Terra-Xehanort (original self of Xemnas) is. In the ending of KH3D, all of the members of the real Organization XIII there are from different points of time through Young Xehanort's use of time travel. None of them are from the present. Hence the way they disappeared at the end when their time is up. So it was Xigbar and Saïx, not Braig and Isa, who were there and they're from the past. Braig and Isa are someplace else in the present time. This is the current situation at the moment unless Nomura retcons it. Oh i get what you mean...kind of. They both might be Seekers of Darkness, it hasn't been confirmed that Braig isn't one. But, if he isn't a Seeker of Darkness, then it has something to do with the "I got my hands full with my own plans" thing he said. If he isn't a Seeker of Darkness, that'd be pretty interesting. That would mean that Xehanort has one extra vessel that we have to destroy. It's also possible that the Braig we see in the Destiny Re:coded cutscene and the Xigbar we see in Dream Drop Distance are the same person. It's possible that Young Xehanort turned him back into a Nobody again for some reason. Maybe because they know that if we destroy him, he'd just eventually be recompleted again, so it's not that big of a deal if we destroy him? But yeah, my money is on Xigbar being back from time travel/them both being alive at the same time. That would explain the whole "I got my hands full with my own plans" thing.